I Wish This Learning Experience Hadn’t Taken Quite So Long! Why do deadlines always sneak up, despite best-laid plans to have projects done WAY ahead of time? That happened when I sent a piece to Vesterheim for their 6th Biennial Benefit Auction. 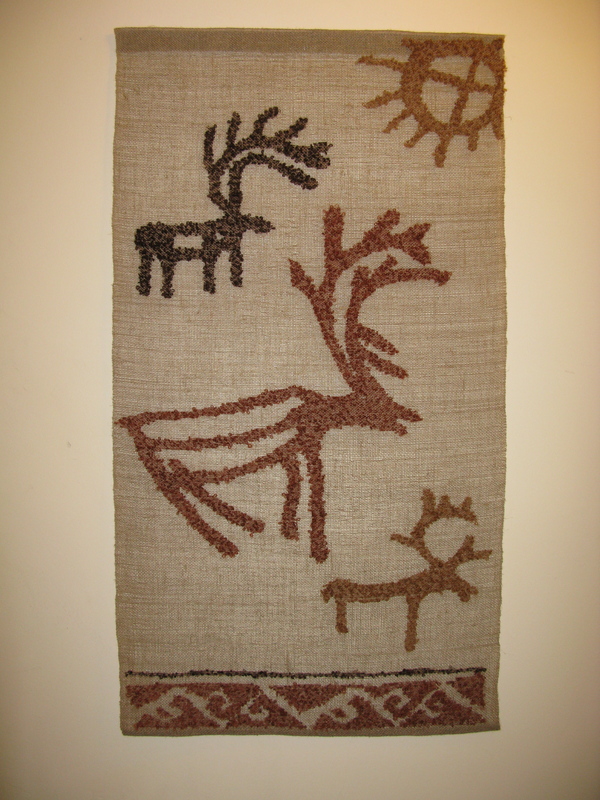 I wove a linen transparency piece early in the summmer, Sami reindeer symbols woven on a natural linen background. All that remained was the finishing work. On night two I popped the three magnets off the plexiglass and sewed them directly to the back of the pocket. Still, not enough strength to hold it. Not enough magnets, I presumed, and sewed on two more. Now it stayed in place but the weight of the piece created just a bit of pulling where the magnets were sewn. I took the plexiglass out of the header. When I snapped it on it looked better! No pulling without the weight of the plexiglass. On night three I found a tiny, tiny dowel to invisibly sew in at the very top to keep the edge perfectly even, and noticed the bottom edge was shorter on one side. Would it never be ready!? Finally, it was, and I found myself at the understaffed post office on the last day to get it in by the deadline. I learned a lesson – and not for the first time! Finishing a weaving is one of the most important aspects of creating a professional work, and one that always takes much more time than anticipated. Next Post: They Have Names!